One of the most prestigious events for an American gymnast in the elite gymnastics calendar is the American Cup. This weekend marks the 2015 AT&T American Cup, which will be held in the Dallas Cowboys AT&T Stadium, one of the biggest venues for this important event. Simone Biles of World Champions Center, Spring, Tx and MyKayla Skinner of Desert Lights, Gilbert, Az will be representing the US women. 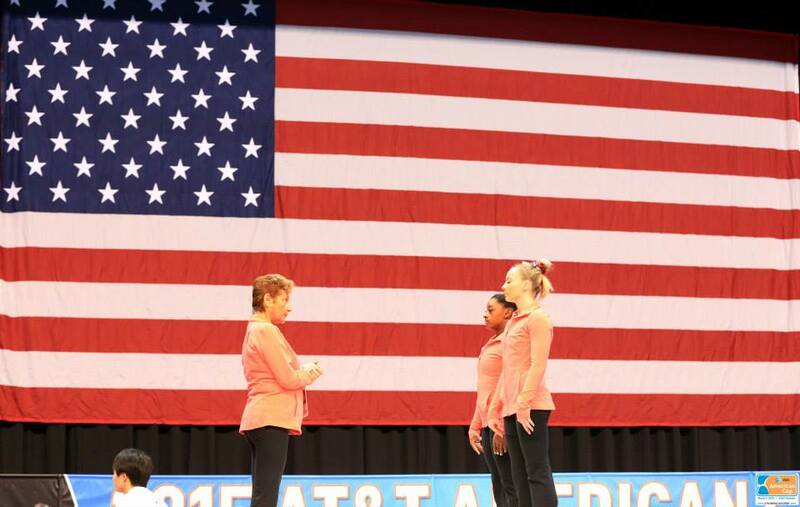 Marta Karyoli, Simone Biles and MyKayla Skinner at the 2015 AT&T American Cup. Photo via USA Gymnastics. Biles, comes into the competition with more to prove than Skinner. As a two time World Champion, Biles is the heavy favorite to win. Though she admits that the stadium could be intimidating, the veteran gymnast said in an interview with USA Gymnastics after training today, “Once you start doing gymnastics, you don’t really pay attention to how big the stadium is, you just focus on what you are doing in the moment.” In an interview earlier this week she said that “You need a big stadium for big gymnastics.” Big gymnastics is what Biles is all about. She is looking to make a great start to her 2015 year, and will be debuting upgrades on bars and floor. 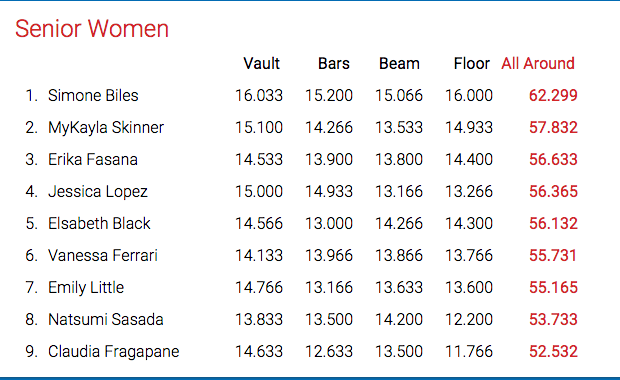 Already competing one of the highest start values in the world on floor, Biles looks to be adding even more with a new opening tumbling pass, while she continues to make the gymnastics look effortless. Don’t miss any of the action on Saturday. Watch the AT&T American Cup live. In the meantime, check out Biles and Skinner’s podium training highlights. Photos and Videos via USA Gymnastics. Everything is different and everything is the same for Simone Biles as she heads into the 2015 AT&T American Cup. The most prestigious international invitational held in the United States will be at the AT&T Stadium (the Dallas Cowboys football stadium) in Arlington, Texas on March 7. Biles and MyKayla Skinner are the two women representing the USA in the competition. In 2013, Biles competed in this prestigious competition as an unproven senior. Though people knew she had potential, she was far from being a sure thing in the world of gymnastics. In a small, cozy arena in Worcester, Mass, Biles won silver to her American teammate, Katelyn Ohashi. Fast forward two years: a new outlook on her gymnastics, a new training center, and multiple world championship titles behind her, Biles is coming into 2015 not only as the favorite for the American Cup, but as the gymnast to beat. Competing near home is also something new. “I’m really excited to compete because I know a lot of my friends and family are going to come. They haven’t seen me compete since one of my first years in elite. There are a lot of people coming out to see me and I’m really excited for them to see me.” Biles, who makes friends everywhere she goes, is also excited to see Jessica Lopez of Venezuela, who she connected with earlier in the year at the Skating and Gymnastics Spectacular. Don’t miss Biles and any of the action at the AT&T American Cup. Watch podium training live on March 5 (Women – 11:30 a.m.-1:30 p.m. ET and Men – 2:30-4:30 p.m. ET) and catch the first 90 minutes of competition on March 7 at 11:30 a.m. on attamericancup.com/live and then the rest of the competion from 1-3 p.m. ET Live on NBC (check local listings).